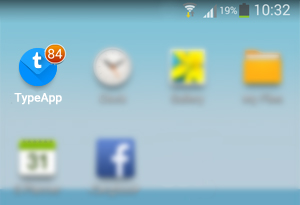 The App Icon Counter (badge) gives you a quick view of the number of Unread emails waiting for you within TypeApp. In our latest version, we have completely redesigned the Icon Counter’s functionality and now feature an Intelligent Counter, which allows the App Icon Counter to automatically clear its value every time the app is opened and your account is visited. We think you are going to love this added ability. Does TypeApp Support Displaying a Badge for My Device? The ability to present a badge on the App Icon is actually dependent on the home screen manager or “launcher” of your device. We do support the badge for the native launchers of many devices, as well as various 3rd-party launchers. If your device is not supported, please check Alternatives to Unread Count Badge on the App Icon. How do I Configure the App Icon Counter (Badge)? With the Intelligent Counter enabled, only new unread emails received in your inbox since the last time you open the account will be calculated into the new App Icon Counter. With just one glance at your home screen, you can now see exactly how many new emails are waiting for you within TypeApp since your last visit. With the Intelligent Counter disabled, all Unread emails in your inbox will be calculated into the number on the App Icon. Select Specific Account- By default, emails from the Unified inbox are used to calculate the Icon Counter. If you would like to select a specific account to be used instead, tap on this option and select your account. Reinitialize Unread Counter- Sometimes the Icon Counter might need to be recalculated in order to see the most updated unread count. Tap on this option if you think the Icon Counter is not currently updated.